In what may be the beginning of a new partnership, Yahoo announced that it will display Google ads next to its search results in a limited experiment. "The test will apply only to traffic from yahoo.com in the U.S. and will not include Yahoo! 's extended network of affiliate or premium publisher partners. The test is expected to last up to two weeks and will be limited to no more than 3% of Yahoo! search queries." Yahoo explores new ways to defend itself against Microsoft's assault. "While there has been some limited interaction between management of our two companies, there has been no meaningful negotiation to conclude an agreement. We understand that you have been meeting to consider and assess your alternatives, including alternative transactions with others in the industry, but we've seen no indication that you have authorized Yahoo! management to negotiate with Microsoft." 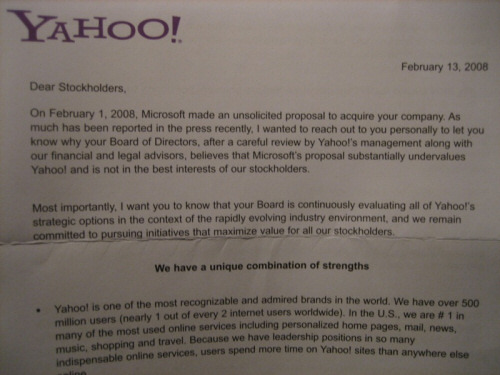 - an extract from a letter sent by Microsoft to Yahoo's Board last week. While switching to Google's search ads means admitting the defeat, Yahoo could use this strategy temporarily. Yahoo has a lot of interesting projects in the mobile space, in search and communication, so the future looks better without Microsoft, a company with a different culture. "If this test — potentially within the three-week window Microsoft set up to launch a proxy fight — pans out and Yahoo also manages to come through with a first-quarter report on Apr. 22 that looks stronger than the current low expectations of analysts, suddenly Yahoo will have some leverage it didn't have before. If the quarter tanks, though, advantage goes back to Microsoft," anticipates Business Week. Update: Some interesting new developments. WSJ reports that "Yahoo Inc. and Time Warner Inc.'s AOL are closing in on a deal to combine their Internet operations". Google already provides search ads for AOL, so Yahoo's test with Google ads is just "a way for Google to test how well Yahoo monetizes", to quote Danny Sullivan. I was reading about that at another blog, it is interesting but not more. Hmm, so Yahoo admits their YPN (adsense alternative) was a flop? I wonder if this is just a way for Yahoo to find out how Adsense works, maybe Yahoo is planning on taking notes on the results and possibly using it to improve YPN. @anonymous I wouldn't exactly call it a flop, I use it on my blog and have made pretty good money from it. Everyone I've talked to who have used both Adsense and YPN says that they make about the same amount of money with both, although YPN doesn't get clicked as often, each click pays more than what Google pays per click.